When I first saw that a fight was likely to be made between Tony Bellew and David Haye, I shrugged my shoulders with disinterest. To my mind, it was a case of Bellew talking himself into a fight that would offer a big payday. It was Haye taking a fight that would be high-profile and lucrative, without carrying the same risk as facing a heavyweight contender. In principle, I had nothing against any of this. Bellew is an experienced veteran who has given his heart and soul to the sport. If he suddenly, in his mid-30s, found himself in position for a big check then good for him. If Haye, even older than Bellew, had figured out a way to get paid without taking a major risk, then good for him, too. Boxing is a business. But I wasn’t terribly interested. I’ll be clear: I was a tiny bit interested. Bellew was a decent light heavyweight contender and has looked better since moving up to cruiserweight. The 175-pound limit may have been too light for his frame, especially as he has aged. And Haye is a former dominant force at cruiserweight, and a belt holder at heavyweight. I still viewed him as a potential dark horse in the heavyweight division. But sometimes boxing can surprise you in a good way. 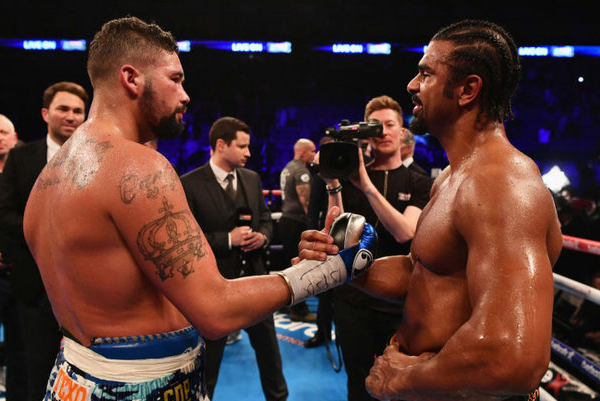 On Saturday in London, Bellew and Haye delivered high drama and excitement. After early rounds marked by tactical movement and well-planned set ups by both men, the fight turned into a gripping encounter from Round 6 to the finish. In that Round, Haye ruptured his Achilles’ tendon. Fighting like a wounded lion, he managed to hold on in that condition for nearly five rounds, dodging and blocking what he could from Bellew and absorbing the rest, while flinging desperation haymakers. Finally, with 2:16 left in Round 11, he could no longer intelligently defend himself. Haye showed tremendous courage and toughness. Bellew beat an injured fighter, but his achievement should not be downgraded because of it. In the early part of the fight, he put in some of the best work of his career, to stay even with a very talented opponent.